There is a widespread consensus about the need for accreditation systems for evaluating post-graduate medical education programs, but accreditation systems differ substantially across countries. A cross-country comparison of accreditation systems could provide valuable input into policy development processes. We reviewed the accreditation systems of five countries: The United States, Canada, The United Kingdom, Germany and Israel. We used three information sources: a literature review, an online search for published information and applications to some accreditation authorities. We used template analysis for coding and identification of major themes. All five systems accredit according to standards, and basically apply the same accreditation tools: site-visits, annual data collection and self-evaluations. Differences were found in format of standards and specifications, the application of tools and accreditation consequences. Over a 20-year period, the review identified a three-phased process of evolution—from a process-based accreditation system, through an adaptation phase, until the employment of an outcome-based accreditation system. 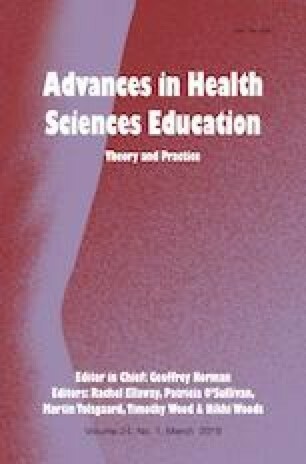 Based on the five-system comparison, we recommend that accrediting authorities: broaden the consequences scale; reconsider the site-visit policy; use multiple data sources; learn from other countries’ experiences with the move to an outcome-based system and take the division of roles into account. The authors would like to thank colleagues from several countries for their kind and very helpful replies to our requests for information: Sarah Taber of the Royal College of Physicians and Surgeons of Canada for conversation and correspondence; Dr. Ramin Parsa-Parsi, Siobhan O’Leary and Elisabeth Jibikilayi of the German Medical Association for their detailed and comprehensive correspondence; Yoram Shapira, Professor Emeritus of Anesthesiology, Chairman of Israeli Supreme Accreditation Board of the Scientific Council of the Israeli Medical Association (at that time), for a comprehensive interview. D. Fishbain declares being an employee of the Israeli Medical Association, one of the authorities mentioned in the manuscript, as the director of its Scientific Council. Y. Danon and R. Nissanholz-Gannot report no declarations of interest. Accreditation Council for Graduate Medical Education (ACGME). (2000–2018). About us Retrieved April 9, 2016 from http://www.acgme.org/About-Us/Overview. Accreditation Council for Graduate Medical Education (ACGME). (2015a). Milestones: Frequently asked questions. Retrieved April 9, 2016 from http://www.acgme.org/Portals/0/MilestonesFAQ.pdf?ver=2015-11-06-115640-040. Accreditation Council for Graduate Medical Education (ACGME). (2015b). Site visit FAQs. Retrieved August 10, 2017 fromhttp://www.acgme.org/What-We-Do/Accreditation/Site-Visit/Site-Visit-FAQs. Accreditation Council for Graduate Medical Education (ACGME) (2015–2016). Data resource book: Academic year 2015–2016. Retrieved July 22, 2017 from http://www.acgme.org/About-Us/Publications-and-Resources/Graduate-Medical-Education-Data-Resource-Book. Accreditation Council for Graduate Medical Education (ACGME). (2016). ACGME program requirements for graduate medical education in internal medicine. Retrieved February 22, 2016 from http://www.acgme.org/Specialties/Program-Requirements-and-FAQs-and-Applications/pfcatid/2/Internal%20Medicine. Accreditation Council for Graduate Medical Education (ACGME). (2018a). Frequently asked questions: Milestones. Retrieved December 3, 2018 from https://www.acgme.org/Portals/0/MilestonesFAQ.pdf?ver=2015-11-06-115640-040. Accreditation Council for Graduate Medical Education (ACGME). (2018b). Use of individual milestones data by external entities for high stakes decisions: A function for which they are not designed or intended. Retrieved December 3, 2018 from https://www.acgme.org/Portals/0/PDFs/Milestones/UseofIndividualMilestonesDatabyExternalEntitiesforHighStakesDecisions.pdf?ver=2018-04-16-143837-240. Berlin, Ä. (2014). Kriterien für die Erteilung einer Befugnis zur Leitung der Weiterbildung zum Facharzt für Innere Medizin. [Criteria for granting the right to lead continuing education as a specialist in internal medicine] German. Retrieved from https://www.aerztekammer-berlin.de/10arzt/15_Weiterbildung/12WB-Informationen/Befugniskriterien/Facharzt-Weiterbildungen/Befugniskriterien_Innere-Medizin-und-Angio_2014.pdf. Canadian Post-MD Education Registry (CAPER). (2015–2016). Annual census of post-M.D. trainees. Retrieved July 22, 2017 from https://caper.ca/en/post-graduate-medical-education/annual-census/. Canadian Residency Accreditation Consortium (CanRAC). (2018a). Connecting CanERA and CBME. Retrieved December 29, 2018 from http://www.canrac.ca/canrac/reform-cbme-e.
Canadian Residency Accreditation Consortium (CanRAC). (2018b). About CanERA. Retrieved December 29, 2018 from http://www.canrac.ca/canrac/about-e.
Canadian Residency Accreditation Consortium (CanRAC). (2018c). Timeline for accreditation reform. Retrieved December 29, 2018 from http://www.canrac.ca/canrac/am-i-affected-e.
General Medical Council (GMC). (1983–2016). Medical act 1983. Retrieved May 10, 2017 from https://www.gmc-uk.org/about/legislation/medical_act.asp. General Medical Council (GMC). (2015). Promoting excellence: Standards for medical education and training. Retrieved May 6, 2016 from https://www.gmc-uk.org/education/standards.asp. General Medical Council (GMC). (2016a). Quality assurance framework. Retrieved December 8, 2016 from http://www.gmc-uk.org/education/qaf.asp. General Medical Council (GMC). (2016b). National training survey 2016-key findings. Retrieved July 22, 2017 from https://www.gmc-uk.org/National_training_survey_2016___key_findings_68462938.pdf. General Medical Council (GMC). (2016c). GMC news for doctors-how the GMC uses the annual fee paid by doctors. Retrieved August 5, 2017 from https://www.gmc-uk.org/publications/29035.asp. General Medical Council (GMC). (2017a). Generic professional capabilities framework. Retrieved May 17, 2017 from https://www.gmc-uk.org/education/postgraduate/GPC.asp. General Medical Council (GMC). (2017b). Exellence by design: Standards for postgraduate curricula. Retrieved December 20, 2018 from https://www.gmc-uk.org/education/standards-guidance-and-curricula/standards-and-outcomes/excellence-by-design. German Medical Association (GMA). (2003–2015). (Model) Specialty training regulations. Retrieved January 1, 2018 from http://www.bundesaerztekammer.de/fileadmin/user_upload/downloads/pdf-Ordner/Weiterbildung/MWBO_Englisch.pdf. German Medical Association (GMA). (2014). Projekt “Evaluation der Weiterbildung” in Deutschland [Project “Evaluation of further education” in Germany], German. Retrieved August 11, 2016 from www.bundesaerztekammer.de/aerzte/aus-weiter-fortbildung/weiterbildung/evaluation-der-weiterbildung/. German Medical Association (GMA). (2015). Bundesweit einheitlicher Kernfragebogen [Nationwide uniform core questionnaire]. Retrieved December 29, 2018 from http://www.bundesaerztekammer.de/aerzte/aus-weiter-fortbildung/weiterbildung/evaluation-der-weiterbildung/bundesweit-einheitlicher-kernfragebogen/. Israeli Medical Association (IMA), Scientific Council. (2014). “ועדת הכרה עליונה” [Supreme Accreditation Board], Hebrew. Retrieved May 12, 2016 from https://www.ima.org.il/mainsitenew/ViewCategory.aspx?CategoryId=1421. Organization for Economic Co-operation and Development (OECD). (2016). Health at a glance, OECD ilibrary. Retrieved 21 July, 2017 from https://www.oecd-ilibrary.org/social-issues-migration-health/health-at-a-glance_19991312. Potts JR. (2013). Implementing the next accreditation system. ACGME Webinar. Retrieved March 11, 2016 from https://www.acgme.org/Portals/0/PFAssets/Nov4NASImpPhaseII.pdf?ver=2015-11-06-120601-263. Royal College of Physicians and Surgeons of Canada (RCPSC), College of Family Physicians of Canada (CFPC) and Collège des médecins du Québec (CMQ). (2004). Royal college residency accreditation commitee policies and procedres: Canadian Residency Education. Retrieved August 5, 2017 from http://www.royalcollege.ca/rcsite/accreditation-pgme-programs/accreditation-residency-programs-e.
Royal College of Physicians and Surgeons of Canada (RCPSC), College of Family Physicians of Canada (CFPC) and Collège des médecins du Québec (CMQ). (2007 Editorial Revision—June 2013). General standards applicable to the University and Affiliated Sites: A standards. Retrieved April 25, 2016 from http://www.royalcollege.ca/rcsite/accreditation-pgme-programs/accreditation-residency-programs-e.
Royal College of Physicians and Surgeons of Canada (RCPSC), College of Family Physicians of Canada (CFPC) and Collège des médecins du Québec (CMQ). (2007 reprinted January 2011). General Standards applicable to all residency programs: B standards. Retrieved April 25, 2016 from http://www.royalcollege.ca/rcsite/accreditation-pgme-programs/accreditation-residency-programs-e.
Royal College of Physicians and Surgeons of Canada (RCPSC), College of Family Physicians of Canada (CFPC) and Collège des médecins du Québec (CMQ). (2012). New terminology for the categories of accreditaion. Retrieved May 12, 2016 from http://www.royalcollege.ca/portal/page/portal/rc/common/documents/accreditation/new_terminology_categories_of_accreditation_june_27_2012_e.pdf. State of Israel. (1973–2017). ““תקנות הרופאים, אישור תואר מומחה ובחינות, התשל”ג- 1973 [Physicians’ Regulations: Approval of Specialty Title and Examinations-1973]. Hebrew. English translation available from: https://www.ima.org.il/internesnew/ViewCategory.aspx?CategoryId=7446.